Nate loves drawing. He keeps markers and pads of paper on his bedside table and I provide him with an unlimited supply of folded and stapled booklets so he can write his funny stories about ninjas, knights and superheroes. On our trips to the library, we always have to pay a visit to the non-fiction shelves and rummage through the instructional drawing books. When I was a kid, I spent hours pouring over Draw 50 Dinosaurs and Other Prehistoric Animals by Lee J. Ames. Nate digs the dinos too, but these days it's all about Ed Emberley. A Caldecott award winning illustrator, Ed Emberley is the Chef Gusteau of illustration. 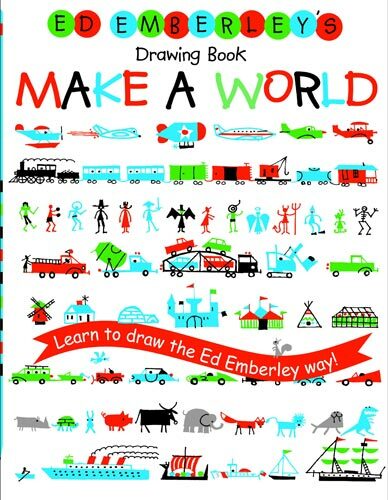 He believes anyone can learn to draw and has created dozens of intricate and engrossing drawing books for children. The style of the books is distinctive and simple, yet astoundingly detailed and comprehensive. Created mostly in the 1970's, they also have a cool retro look and feel. 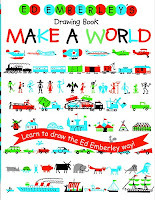 From trucks and trains to animals and monsters, Emberley uses basic lines, dots, circles, and squares to create a diverse world inhabited by funny little stick people. And, he shows you how to do it step by tiny step. Nate doesn't pay much attention to authors' names yet, but he knows who Ed Emberley is. "I love Ed Emberley!" he says. Me too. Picture books are still a big part of our daily diet, but as Nate turns 7 in April, we've been checking out more graphic novel-ish books that appeal to his our goofy sense of humor. 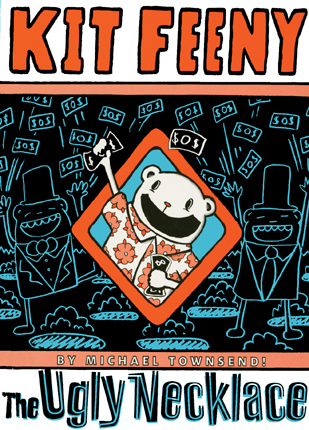 Michael Townsend's Kit Feeny series hits the nail on the head. Along with series like Dav Pilkey's Captain Underpants, George Beard and Harold Hutchins' Ook and Gluk, James Kochalka's Johnny Boo and Dragon Puncher, and TV shows like Spongebob Squarepants, The Marvelous Misadventures of Flapjack, and the most excellent Adventure Time, there's a faction of writer-illustrators out there that work in a juvenile-yet-polished visual style with a steady stream of poopy jokes and head bonks. For a first grade boy, it's literary gold. Kit Feeny is a goofy boy-bear with a pair of annoying sisters and a wacky imagination that gets him in trouble. The 2-color comic book format is loaded with zany speech bubbles and sound effects. Nate gets a glazed look over his eyes as I read aloud the ridiculous dialogue. I stop to check: "Do you like this?" I ask. "Yes, keep going," he mumbles. Nate's lost in the magic. I lived in New York City from 1997 to 2005, and didn't get a cell phone until around 2000. It was a Motorola V60 clamshell and I loved it sooo much. It's hard to even remember life before cellphones and smartphones, but somehow we survived. Everyone had an answering machine at home and you either had to run home and check your messages or call home from work or a pay phone. If my home phone rang more than twice, I knew I didn't have any messages, so I'd quickly hang up the pay phone to get my quarter back. It was the dang stone age! My children will never know that world. 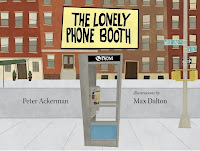 Thank goodness for the utterly charming The Lonely Phone Booth. 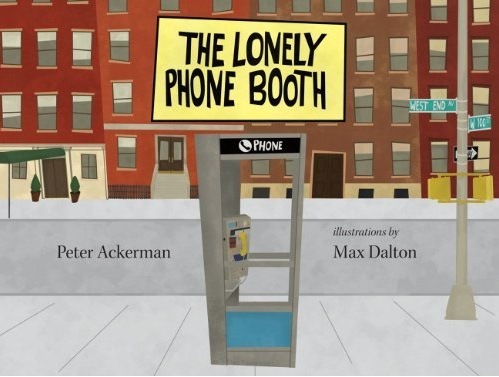 Set on the corner of West End Avenue and 100th street in New York City, one day a well-used phone booth begins to notice its regular customers don't seem to need it anymore. Everyone's talking into strange little silver objects and the phone booth is forgotten. It's not until a lightning storm knocks out the cell phone towers that everyone suddenly begins to appreciate the good ol' phone booth again. The tone of this book is pitch perfect. It not only captures a major transitional moment in our history of connectivity, but also gives a surprisingly touching personality to an inanimate object. The Lonely Phone Booth encourages us to notice our surroundings and take note of the technologies that loyally serve us until we discard them for the next great thing. I'm going to go give my iPad a hug now.